If you’re preparing to purchase a wedding ring, diamond pendant or another special piece, you may be wondering about the differences between platinum jewelry and white gold jewelry. Most jewelry is made from platinum, gold or white gold, and platinum and white gold often look very similar, leaving many jewelry shoppers confused. When deciding between these metals, there are a few different factors to consider, including the metal’s strength, cost and likelihood of creating an allergic reaction in certain sensitive individuals. Many people aren’t aware that white gold is not actually a metal in and of itself. It’s actually an alloy that is usually formed by mixing 75 percent yellow gold and 25 percent other metals. It’s also usually plated with rhodium, a silver-colored metal that looks like platinum. However, this plating will fade and wear over time, which means that a white gold ring will require some professional maintenance if you want to keep it looking its best throughout the years. Unlike white gold, platinum jewelry is up to 95 percent pure and does not need plating to look lustrous. Therefore, it won’t require much maintenance in the future. Over time, the color of the metal will dull a little, but this is actually a trait that makes platinum more desirable, as a slightly dull platinum can bring out the color and sparkle in your diamond setting. When it comes to strength, platinum is far ahead of white gold. It’s known for its long term durability, which makes it a wonderful metal choice for diamond settings. It’s not completely immune to scratches, but because of the its density, these scratches will not usually result in any serious damage. White gold, on the other hand, is a much softer and more delicate metal. Pure white gold will easily become scratched and worn away, resulting in the band of your ring thinning over time. To help prevent this issue, harder metals, such as nickel, are usually mixed with white gold. Based on what we’ve said so far, it may seem that platinum is the clear winner. However, cost also must be taken into account, and white gold is much more affordable than platinum. Each year, only 160 tons of platinum are mined compared to 1,500 tons of gold. The rarity, density and quality of platinum make it the more luxurious choice, but many people still opt for white gold because the money they save on the metal can be used to purchase a more expensive diamond. Because of the other metals that are sometimes used in white gold jewelry, certain individuals may have an allergic reaction. Nickel is unfortunately a common allergen, and if you aren’t sure whether or not the loved one for whom you’re buying the ring is sensitive to it, you might want to think twice about buying a white gold ring. Platinum does not cause allergic reactions and is better for those with sensitive skin. If you do choose white gold, be sure to talk to your jewelry artisan about what metals were used in the band before making your purchase. As you can see, there are positives and negatives to both platinum and white gold. What is right for your ring will depend on your individual preferences. 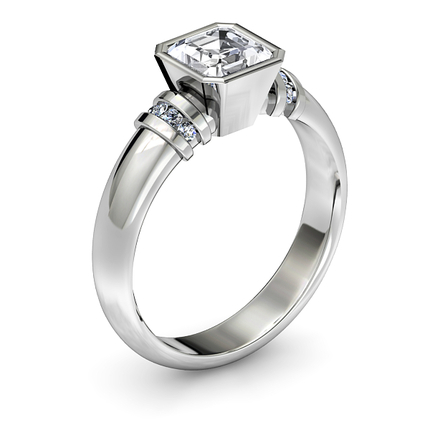 If you’re ready to begin shopping for platinum or white gold jewelry, contact Juno Jewelry today. We have over 30 years of experience working with fine jewelry, and we are excited to help you find what you’re searching for.